Another award for David Beggs! 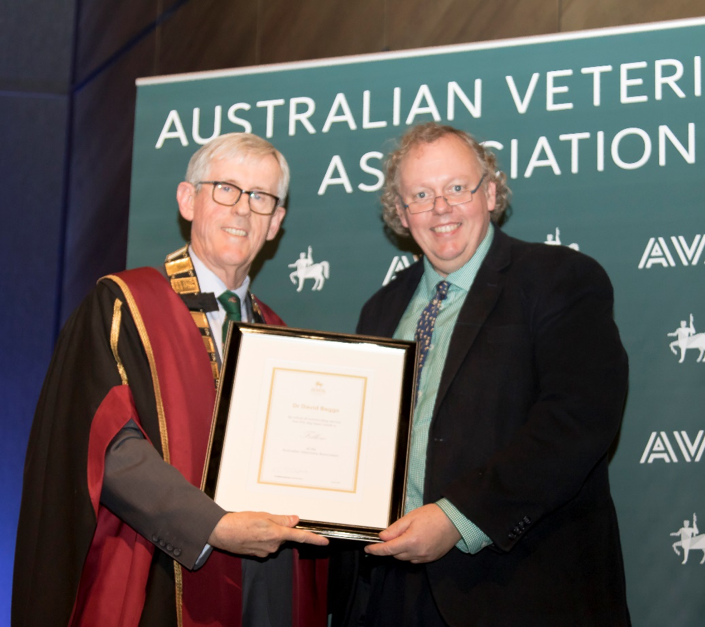 A huge congratulations to Dr Dave Beggs who was awarded a Fellowship Award at this year’s Australian Veterinary Association Conference in Melbourne. Fellows of the Australian Veterinary Association are members who have rendered outstanding service for the Association. This is the Association’s most senior award for service to the AVA and is awarded only for the most truly outstanding service. We only see Beggsy occasionally at Warrnambool Veterinary, but he still works here helping to coordinate and analyse our research projects and trials and assisting with the management of Melbourne University residents. He also makes sure the practice computer system works well, and works to upgrade and improve our software programs Dairy Data and Farm Cash. Away from the clinic Beggsy lectures Melbourne University students, and is in the process of writing up his PhD in cattle welfare. He spends a lot of time voluntarily as the Scientific Officer for the Australian Cattle Vets and helps organise Australian Veterinary Association conferences. In his spare time he is on a number of advisory committees such as the Australian Mastitis Council, the Veterinary Practitioners Board of Victoria, and the Animal Welfare Advisory Committee. Warrnambool Veterinary is extremely proud to see Dave honoured with such a prestigious award and thanks him for all his contributions to making Warrnambool Veterinary and the cattle industries of Australia successful!